A rare and storied 340/375 MM Berlinetta Competizione sold for nearly $13 million. Only Cameron's Dad's Ferrari is more desirable. In the world of vintage European sports cars the stars sometimes align and a car comes up for auction that has all the right ingredients for an exorbitant auction price. The key ingredients are a unique vehicle that was made in limited numbers, the car having been driven by famous people at famous events, and the economic situation at the time allowing for a buyer to strike. These three elements were in place this week and an Italian record was set for the price of a vintage 340/375 MM Berlinetta Competizione with special Pinin Farina body. The final price tag? 9,856,000 Euros. That is nearly $13 million dollars. That is the highest price ever paid in Italy for any work of art, car or otherwise. This particular Ferrari was a front engine V12, the layout most desired by collectors. Commenting on the car Max Girardo, Managing Director of RM Auctions Europe, said “Chassis number 0320AM presents a once-in-a-lifetime opportunity for serious collectors to acquire one of the world’s most significant racing Ferraris.” The car had been driven by some of motor racings greats. Three Formula 1 world champions drove the car including the first F1 Drivers Champion, Giuseppe Farina, the first multi-year champion, Alberto Ascari, and Mike Hawthorn also drove the car. The car was fast for the time and fast for this time as well. It still holds a road course speed record. 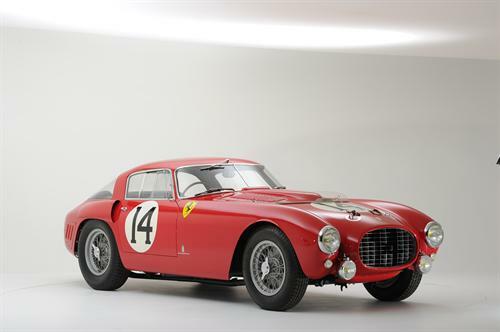 Ferraris at auction such as Testa Rossas (also called TRs which means Red Head in Italian), and 250GT Californias can fetch over $ 10 million at auction. Even copies of these cars can bring in big dollars. Cameron’s dad’s 1961 Ferrari 250 GT California, which he, Ferris, and Sloane took off in during Ferris’ day off went for well over $100,000.00 at auction. And it was a replica, not a real Ferrari. However, it had been extremely well cared for prior to its unfortunate mishap in the glass garage. As described by Cameron, “He (dad) never drives it, he just rubs it with a diaper.” An almost identical car, this one real, sold about 6 months ago for $ 11,275,000.00. It had only been owned by two people and was in perfect condition. According to a press release by RM Auction, only one other Ferrari, a 250 TR went for more than this car, selling for $16.9 million two years ago. This recent sale of this unique racing Ferrari was held at Lake Como in Italy at Villa Erba. Rumors that the buyer’s son is planning a day-trip to Chicago are completely unfounded as far as you know.